No Nonsense is making its big break into the community. The band will help kick off the ribbon cutting ceremony for the Hub Thursday at noon. 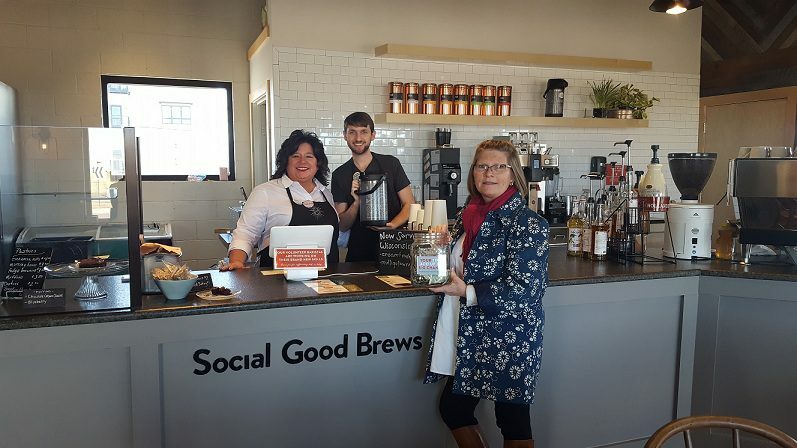 The Hub is a coffee shop opened by the Washington County Volunteer Center on Water Street in West Bend. There have been several soft openings, and a weekend-long Grand Opening will begin May 17. The ribbon cutting marks the beginning of regular business hours. 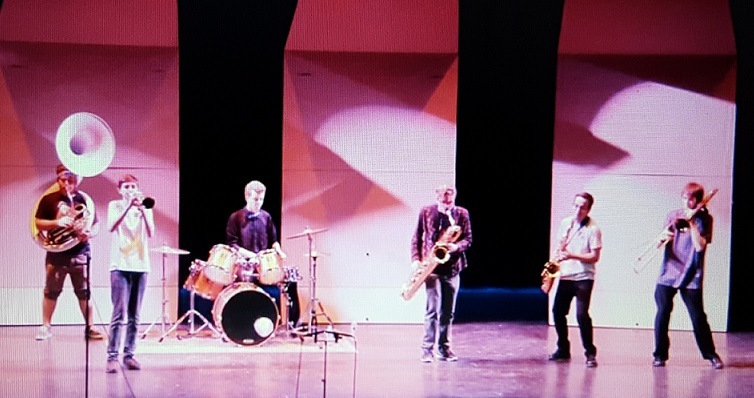 It’s fitting that No Nonsense, a band created by West Bend High School students, will be there, considering the band began to form in a local restaurant. Current members of the band are Novotny, Spencer Hikade, Nick Theisen, Jake Clemetson, Connor Hall and Cody Clark. Novotny aspires to make an impression on the community members who will be present at the ceremony. According to WBHS band director Leah Duckert-Kroll, No Nonsense has the talent to impress the crowd. Duckert-Kroll was the orchestrator of this gig for No Nonsense. Sue Millin, the executive director of the Volunteer Center, reached out to Duckert-Kroll, asking if the WBHS drumline could play. Duckert-Kroll saw an opportunity and recommended No Nonsense. The band’s willingness to help the community has not gone unappreciated. “We are so grateful to No Nonsense for helping us to kick off this great community project,” Millin said. No Nonsense will be picked up from WBHS on the Do Good Bus, which is another community project from the Volunteer Center. The Do Good Bus picks up volunteers, but there is a twist. The volunteers usually do not know where they are going to volunteer until they get there. This project eventually led to the creation of The Hub. The Hub is mostly volunteer-run, with only one paid manager. Keeping with the true sense of volunteering, all tips made will be donated to a different featured nonprofit each week. But the true purpose of the Hub is to introduce people to new volunteer opportunities. So far the Hub has 48 volunteers who have agreed to help run the shop. The community has been fully supportive of this endeavor. 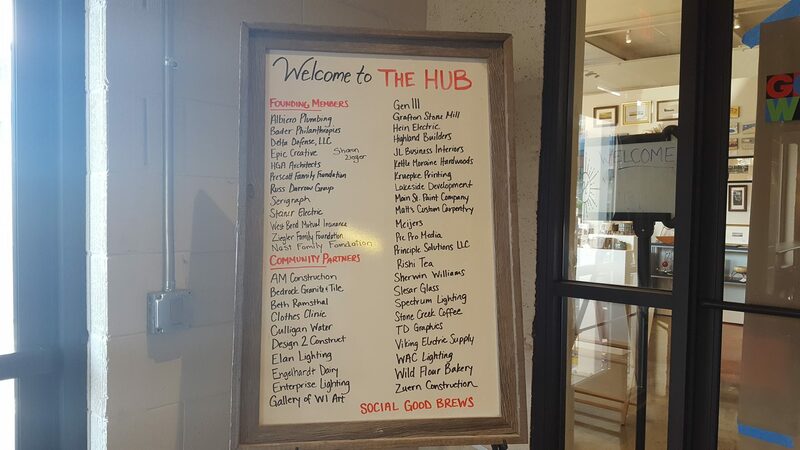 It was through the donations and services of local businesses and people that the Hub was built. The Hub is still keeping it fairly local by serving beverages from Stone Creek Coffee, a Milwaukee company. In addition, all the volunteers have been professionally trained by the company. “We chose Stone Creek because of their strong connections and their beliefs and their mission really did align with ours,” Millin said. Regular business hours for the Hub will be 7 a.m. to 7 p.m. Tuesday through Friday, and 7 a.m. to 4 p.m. Saturday and Sunday. You can also catch No Nonsense twice Friday. They will perform at the WBHS talent show inside the Silver Lining Arts Center and also at the Home, Sporting & Recreation Expo inside the Washington County Fair Park & Conference Center.